It's ten o’clock Thursday morning and for one brief hour the sun is out during this bleakest of springs. I’m in a Shoreditch café already beginning to bustle with Wi-Fi leeches, each studiously plugged into their laptops, finger tapping and caffeine fueled, apparently hard at work. Maybe they're blogging, or remixing their mates BITpop album, perhaps giving Homeland a femslash reworking, but all undoubtedly creating, after all THIS IS SHOREDITCH. I tuck my self into a quiet corner and wait to meet actor Cavan Clerkin who I’ve come to talk to about his new feature film Nice Guy, a self-financed, ultra low budget British crime drama which has been mostly filmed in the Eastend, especially Stoke Newington. When he does walk in, Clerkin is instantly recognizable from his years as a character actor in TV and film roles, roles that have seen him slipping into UK comedy shows like the IT Crowd, Pulling, Sean Lock’s Fifteen Stories High, Smack the Pony and 2001′s Los Dos Bros.
Introduction aside I ask him how he started acting and he jumps in by explaining how it began as a teenager just round the corner in Hoxton Hall, where he and his friends were granted open access to the video equipment and allowed to run riot with the cameras. “We use to make these mad gangster, ninja epics. We had no idea about film making but we would just shoot stuff and hack it together,” he enthuses, clearly still excited by the buzz of these early ventures into film making. Sadly the world wasn’t ready for these sensitive coming of age tales but Clerkin stuck with acting, carving out a career that has now kept him off the streets and out of a life of imaginable delinquency (just a little creative license employed here) for almost fourteen years. In 2009 and keen to return to developing film projects, Clerkin became one of the founding members of The Sunday Film Club, a collective of actors and film makers who would meet up weekly to band around ideas for film projects. Determined to work democratically they began to pull words out of a hat, these would form the initial genesis for a short film that the group would then all work on. As Cavan explains, “You’d have two week to write it, one day to shoot and then two weeks to edit it and at the end you had to show the film to the group.” With each new short the members would swap roles, for example the director of one film becoming perhaps the soundman on the next. After a period of seventeen months, and having produced nineteen shorts the club had developed into a cohesive and increasingly ambitious unit. 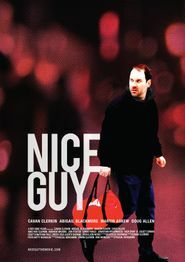 Taking a pitch for a short film by member Martin Askew as the starting point the club decided to embark on their most adventurous idea to date, a full-length feature, Nice Guy, to be written by Cavan and directed by feature first timer Pascal Bergamin. When I ask Cavan what made the club feel they were ready to make a feature length film, he grins and admits that they never did, but that they finally agreed that the only way to answer that question would be from trying. The script was written using a series of workshops and rewrites but with the aim to continually improvise throughout the intense three week shoot with director Bergamin encouraging the actors, both professional and amateur, to help flesh out the characters as they saw fit. Clerkin himself plays the main character of David, a househusband and father whose marriage begins to fall apart leading him to booze, strip joints and – when he witness a brutal murder – into a world of lowlife criminals and violence, a world that threatens to engulf his family. Describing his writing process as very plot driven, Clerkin is keen to stress how they wished to avoid the hackneyed tropes of the cockney gangster (see Danny Dyer), instead concentrating on David’s role as a father to his son, who is convincingly played by Cavan’s real life flesh and blood Kiko, who was often blissfully unaware of the film being made around him as many of the crew were already regular house guests. The money for the film, a mere £8,000 was mostly put up by Clerkin and Bergamin themselves who opted to shoot on High Def video DSLR’s, firstly to help keep costs down but also for the rich and saturated images these cameras can produce. The cast, including recognizable faces likes Andrew Brooke, (PhoneShop, Pulling) and Juliet Cowan (Pulling, This Life) as well as the crew all worked for free, a commitment without which the film could not have been made. Yet it was the post production which proved to be the most grueling part of the process, with the film makers having to outsource certain tasks to whomever was willing to get involved, with things like the sound editing eventually being completed in Switzerland by recording engineer Greg Skerman in his spare time simply because he loved the film. Considering the totally affordable budget I ask Cavan if he thinks that he could make one of these films a year? “I could,” he quips, “but it would probably end in me getting a divorce.” And he is certain that any future film projects will probably require more funding. “Currently we’re self-distributing and when we started we had no idea about distribution and we’ve learned the tough way,” and it’s a sore point with an extra £2000 rapidly swallowed for publicity. Though despite this, the film is out there and available to watch on Google’s new movie streaming service, GooglePlay and YouTube rental. It is perhaps these services that are the answer for films of this nature; Super low production costs coupled with super low cost online streaming. The interview over, I bid Cavan farewell and step out on to a street presently sleeting with snow, I look back into the café at the row of flipped laptop screens. Rather than the imagined inventiveness that I had earlier assumed I can now see that every single one of the “creatives” is logged on to the online retailer ASOS; consumption rather than production I think loftily, but also happy in the knowledge that there are people who are continuing to struggle in order to produce their creative visions against insurmountable odds.